Once upon a time (2010) my sloping front yard was just that- a yard. There were two sad plants among a sea of grass. Matt and I decide we wanted to put in a retaining wall, minimizing the grass and maximizing our planting capacity, and adding a little curb appeal. 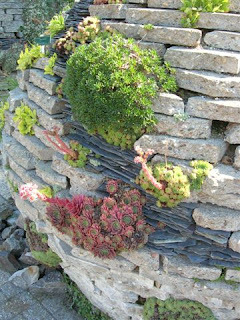 Not wanting to use environmentally-destructive and expensive stone, I began searching for urbanite inspiration on the internets. "Urbanite" facetiously refers to reused slabs of concrete that usually come from sidewalks or driveways. These are a couple of walls I found and liked. My stone mason friend, Wyatt, graciously worked within our budget to create a piece of art that will only improve with age. 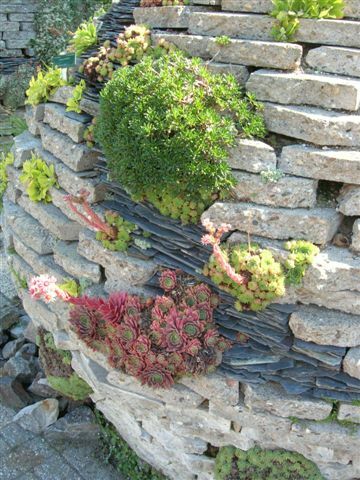 Plants like kinnickinnick and coastal strawberries will cascade down the wall, while ferns and other natives will peak out from pockets in the wall, and plants of varying heights will grow above and below the wall. You may need to don your 5-years-in-the-future glasses to appreciate the planning here. Some day soon, the space at the base of the wall will be filled with gravel or river rock and native grasses. Wyatt also created lovely steps and a walkway leading up to the front door, allowing guests to avoid squeezing by the car in the driveway. Our mailman left a note, thanking us for his new walkway. Like the wall, the path was created by expertly joining together slabs of concrete and filling the spaces with rocks found throughout our garden. You'll notice the beginnings of sheet mulching efforts in the front. To many, this free material may not be as sophisticated as stone, but I love the juxtaposition of the various materials represented in this project, from the moss-covered blocks to the slabs allowing a cross-section view of the concrete ingredients, to the natural river rock. Here you can see several opportunities for pocket plantings. We have a few more urbanite projects happening in our garden. And you, lucky readers, will learn all about them in upcoming posts. Have you seen urbanite used in interesting ways?